Gilgandra, NSW farmer Keith Mudford was very content with his Croplands Spray Coupe self propelled sprayer, but when his sons expanded the family's cropping operations and the total cropping was increased, Keith traded in his Spray Coupe on a Croplands RoGator 1084 self propelled sprayer. With an 800ha cropping program and a self-replacing Merino flock, the Croplands Spray Coupe self propelled sprayer with it's 18.2m boom and 1500 litre tank easily achieved Keith's busy program. However when his sons, Ray and Michael, expanded the cropping operations to another farm 35km away, total cropping was increased to 2800ha, which presented an obvious need for a bigger sprayer to integrate with three air seeders at sowing and to be employed almost year-round on the properties for weed suppression and foliar spraying duties. 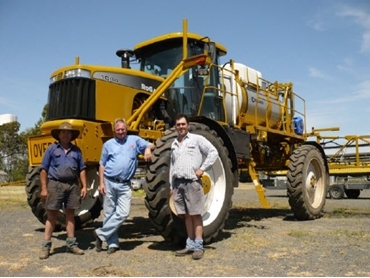 So having notched up 4000 hours with the Croplands Spray Coupe self propelled sprayer, Keith and his sons traded it in on a Croplands RoGator 1084 self propelled sprayer, equipped with a 30m boom and a 4000L tank capacity. The new model has provided the Mudfords with a much needed productivity lift, greater flexibility to make maximum use of spraying windows and a walk-up start to expand their controlled traffic farming (CTF) program. With 350 spraying hours already on the clock, plans are on the drawing board to fit a 36m boom to the model for greater spraying capacity on 1.2km long spraying lines. “The sprayer is an integral part of the business,” says Keith. “It’s in use more days than not and with the new model we can do things faster with the ability to carry more water and stay out longer between re-fills. “We’re achieving between 60 and 65ha an hour and getting between 80 to a 100ha a tank load, depending on conditions. So we can maximise opportunities to spray when they present themselves and because the boom is so stable we know the chemical has a good chance of hitting the targets,” adds Keith. As a main workhorse, it is only right to expect the 1084 self propelled sprayer not only to deliver reliable performance but also a high degree of cab comfort and a feeling of safety from chemical spray, particularly on shifts that can last up to 12 hours. In this regard, Keith says the 1084 delivers on all counts. “We also like the 55km on-road speed to get between farms, and in operation on the soft black country it has good lugging power under load and generally doesn’t drop off the revs,” says Keith. Keith’s son Ray, who is one of the main drivers, agrees with his dad: “I usually spray between 18 to 22km/h and the boom is very stable, even if you hit a rough patch. And with the skinny tyres you don’t kick up much dust, even at the speeds we operate. It just leaves a good footprint and the drive is very smooth too. We should have got one years ago." One of the features of the 1084 self propelled sprayer's front-mounted Tier Three 7.2L CAT C7 fully electronic-controlled engine, is that it delivers 205kW with a power curve bulge to 223kW, with the bulge taking immediate effect once the machine drops below rated speed. The torque rise matches the power bulge bringing the operator more lugging power when paddock conditions demand it and half of the engine’s torque rise happens in the first 300rpms below rated speed. Croplands RoGator 1084 self propelled sprayers really excel in wet conditions where the revs need to be kept up. They handle conditions easily, providing little distraction from concentration on spraying. This is mainly due to the tandem hydrostat cross-drive system that RoGator developed, which is now found on almost every hydrostatic self propelled sprayer in the market. The tandem hydrostat design drives the wheel motors in an “X” pattern, ensuring evenly distributed flow to the motors. If one tyre breaks traction, two others are still driving. For example, when the machine is driven through a corner, the outside wheels need more hydraulic flow than the inside wheels and this is achieved without wasting power or creating unwanted heat build-up. The Sampo radial-piston wheel motors are designed for high-starting torque for quick machine response to operator input and are always engaged in four-wheel drive. Low to high speed is achieved with four shift-on-the-go speed ranges. Another important aspect of the Croplands RoGagtor 1084 self propelled sprayer is suspension. The RoGator leaf spring system employs a soft ride leaf that is longer than a standard leaf spring package. The spring is attached directly at the front end, with the rear attached through a short swing arm shackle which allows more movement from the spring and a softer ride. The use of a shock absorber at each corner also improves the suspension’s ability to handle sharp impacts and dampens out the rebound of the suspension. Croplands Equipment notes an advantage of a leaf spring over an air, hydraulic or coil spring suspension is that the leaf spring is attached to the frame directly at two points. This allows it to spread the load more widely over the vehicle’s chassis rather than transferring it to a single point. Furthermore, a leaf spring machine will hold a row better than any other suspension type because it eliminates the body roll that causes the machine to wander in the row. Keith also likes the fact that when the door is closed air is expelled preventing any outside chemical drift present from entering the cab. “It also keeps the dust out too."